Clicking the + icon button on the top navigation bar will show a list of links to the most commonly-used NowRenting features, for quick access. 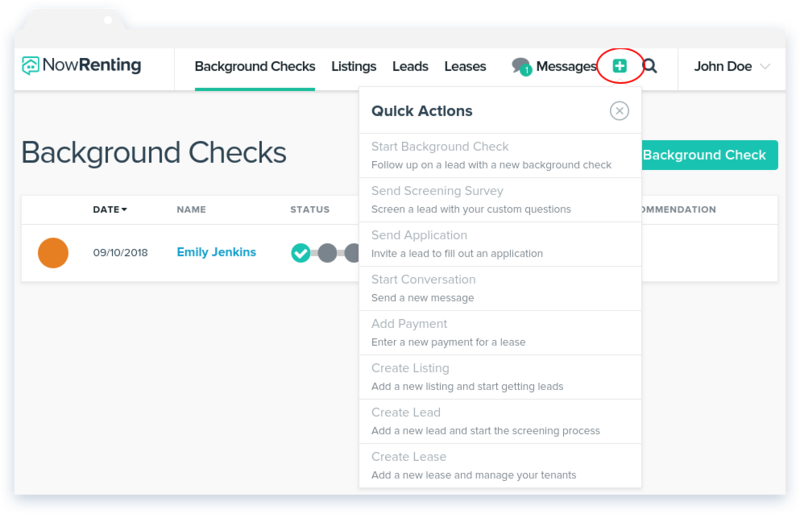 Start Background Check: Follow up on a Lead with a new background check. See here for more information. Send Screening Survey: Screen a Lead with your custom questions. See here for more information on the screening questionnaire. Send Application: Invite a Lead to fill out an application. Start Conversation: Send a new message. Add Payment: Enter a new payment for a Lease. See here for more information. Create Listing: Add a new Listing and start getting Leads. See here for more information. Create Lead: Add a new Lead and start the screening process. See here for more information. Create Lease: Add a new Lease and manage your tenants. See here for more information.